Pretty good stuff. The chocolate chip pieces don't make a very big visual impact (they look like a few random specks), but they do effect the overall flavor quite a bit. To get the most out of this product, let the cooked oatmeal rest a few seconds and then stir it up. The chocolate distributes and those tiny specks turn into melted streaks of chocolate giving the product a more uniform flavor, while still providing the surprise of a few bites with more chocolate. This oatmeal tastes more chocolatey than sugary, but be aware that it has 8 grams of sugar per serving. If that's a concern, there are several instant oatmeal varieties available with less then 3 grams of sugar and much more fiber. Personally, I found 1/3 cup water per packet (as the directions state) made the oatmeal a little too soupy. I'd recommend closer to 1/4 cup. Nutritional Considerations: Each single packet serving has 130 calories, 2 grams total fat (0 saturated and 0 trans), 0 mg cholesterol, 150 mg sodium, 2 grams dietary fiber, 8 grams sugars and 3 grams protein. The first three ingredients listed on the side panel are whole grain oats, sugar and semi-sweet chocolate chips. What do you think of Chocolate Chip Oatmeal? Very good. The chocolate flavor is apparent without being overpowering. One-third cup of water works if you give the oatmeal an extra 15 seconds in the microwave, and make sure to stir well at the end. I'll have to try it again the way you recommended it. Because when I tried it I couldn't taste the chocolate at all! 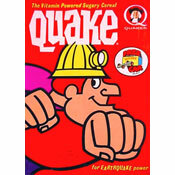 This became my favorite kind of oatmeal after the first bite, and since then its the only kind I've eaten. I love chocolate, and the fact that:-) this stuff has real, melty chocolate makes it the ultimate breakfast. I only like oatmeal when its made with milk, which supposedly gives it a richer taste. You can take that into consideration when I say this oatmeal is really truly delicious. I agree that this is a pretty good product. To me it tasted exactly like a chocolate chip cookie in oatmeal form. Mr. Breakfast is right about letting it sit for a moment as well as about adding a little less water than it calls for. 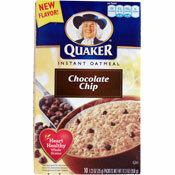 Overall, this chocolate chip flavor is not mind-blowing, but it's a nice addition to the Quaker line.